My sewing is done for the rest of the year. I'm really excited for Christmas and all the family will be around for the next few days. Merry Christmas to you all, and we'll chat in the New Year! 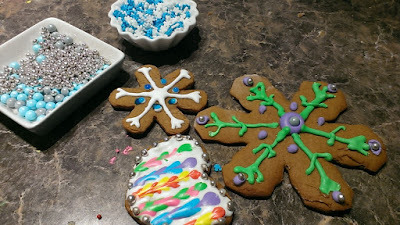 While Aurora was here last week making gingerbread cookies, she asked if I could make her teacher a gift, like I did last year... 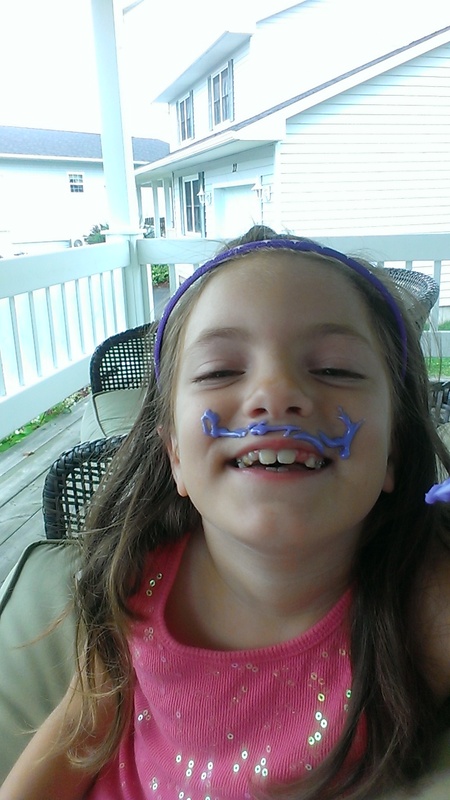 Her teacher's name is Mr. Fleming. Now, right away, I thought to myself.... Mr. 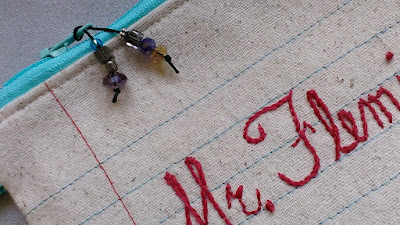 Fleming.....I've not made a male teacher gift before. 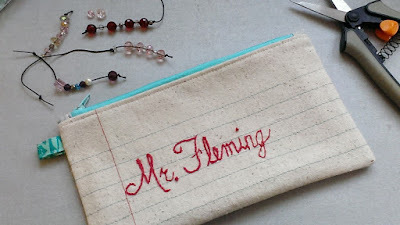 I asked Aurora what I should make, and in her mind, there was no question.... she wanted a Pencil Case with his name on it... Now to me, it's such a great gift for a girl teacher, but I wonder if it will be too girly for Mr. Fleming. Well, I wrapped my head around it, and the reason I do this, is to reinforce the good feelings of gift giving to Aurora. So with Aurora in mind, I made Mr. Fleming's pencil case. Can you ever have enough Thread!! 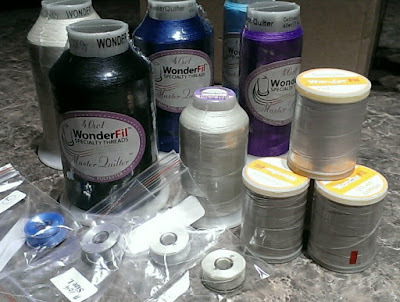 Today I received a box full of Wonderfil Threads from the Wonderfil Canada folks. 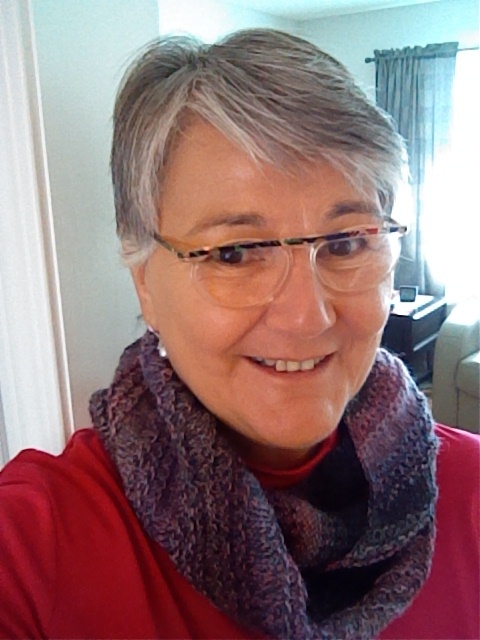 I just love my finished cowl. 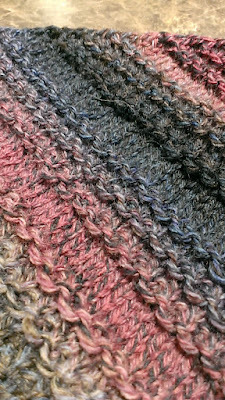 I knit over half of it while on vacation last month, and it didn't take long to finish it once I got home. I've worn it a couple of times. It was so easy to do and I might do another... It's a free pattern on Ravelry, called That Nice Stitch. These are little works of art. Notice Caitlin's Gingerbread Girl with a bikini on. 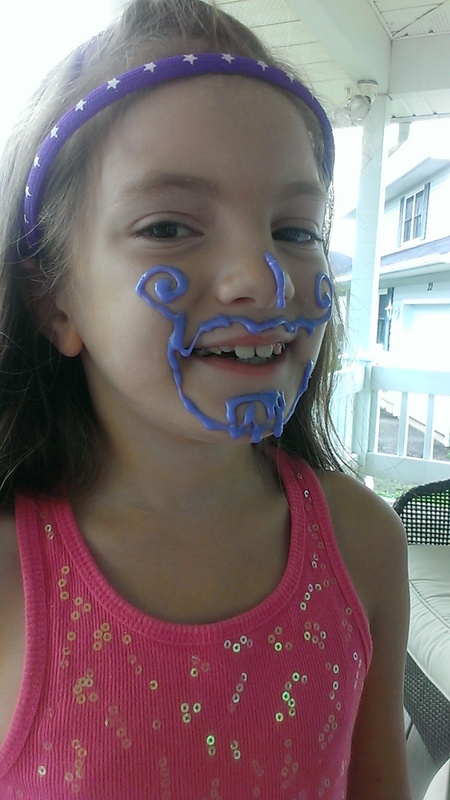 She's expert level at decorating. 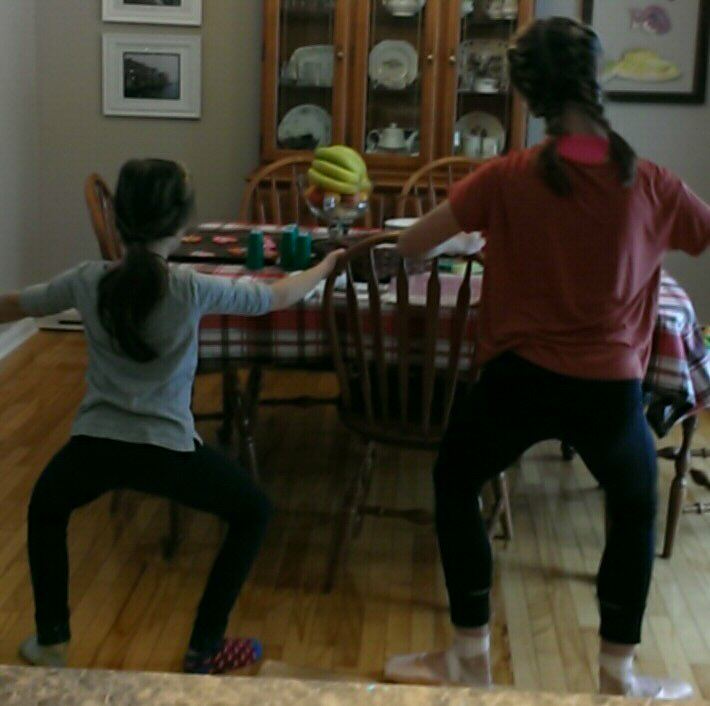 She and Grace have been doing this for 12 years. 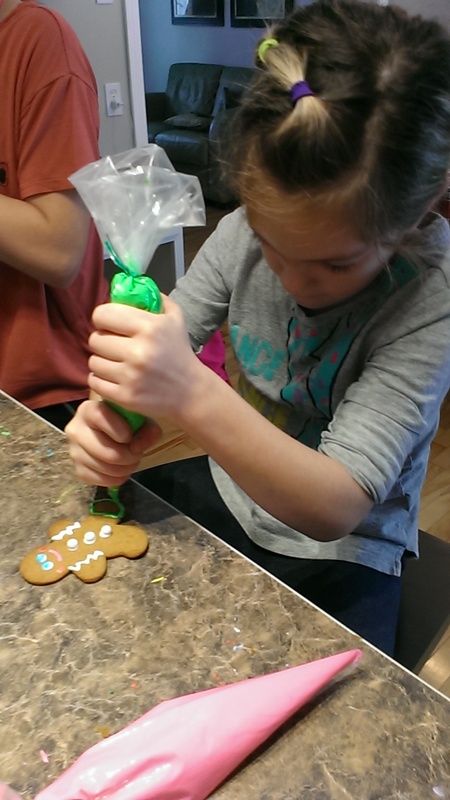 Using a toothpick to move around the icing. Aurora is getting really good too. It's her 5th or 6th year doing this. She loves being with her cousins... Such a treat. 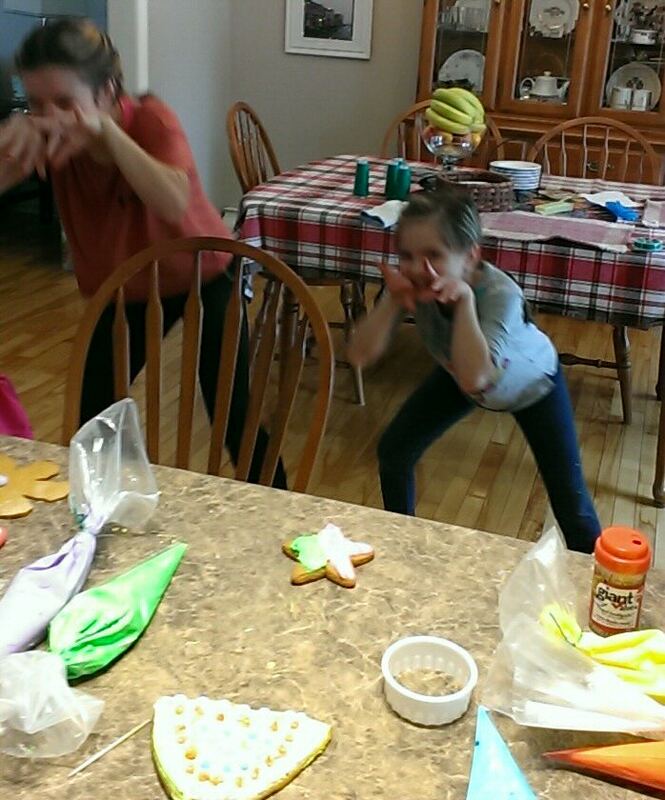 the mouse dance from the Nutcracker! looks 6 feet tall when wearing her point shoes. After all that, I'm back in the sewing room. 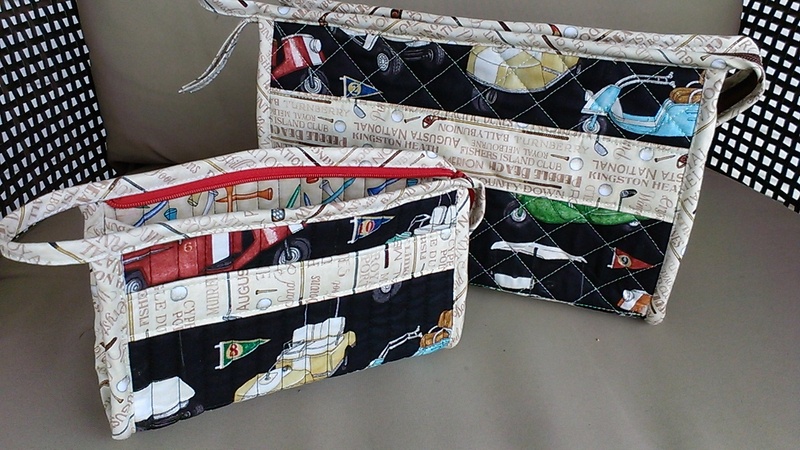 I have a few wallets on the go, and they will make their way to Nova Scotia soon. Photo by my friend Linda H.
I'm preparing my scraps for an uber mega scrap quilt project that I will take to Florida with me next month. 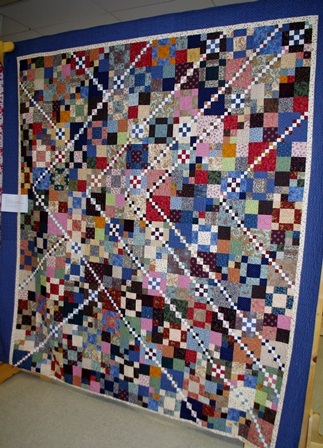 I first saw this Trail Mix quilt when my friend Margie had put it in our last guild's quilt show. I thought it was a fabulous way to use up scraps.. I love the design. The diagonal lines give it that special look. I have a bunch of scraps all ironed and if we get another power interruption during the day, I have everything ready to cut blocks..... Just in case you want use up your scraps, it's a free pattern from BHG. But first, I thought I'd show you how much I got done on my cowl. We had some sea days, and to my surprise, there was a stitching and knitting get together in the afternoon on sea days. What a nice chance to meet other like minded people. There was about 20 people who met for tea and of course brought their projects along. I enjoyed the social aspect, and while I brought my bag of knitting, I did more talking than knitting. I did get one ball knit, and the other ball, I've knit since coming home. The pattern says to make it 48" inches, and I didn't quite have enough, so I'm now into the third ball. I really like the pattern It's easy to do from memory you have the first 20 or so rows done. I just love the texture and the diagonal design. 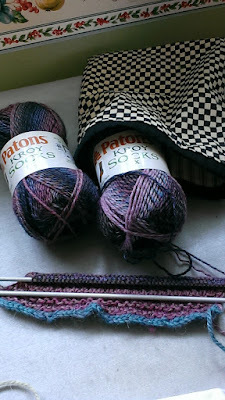 I love working with the Kroy sock yarn. so smooth and easy to knit. The timing couldn't be better because the near zero degree days are here and I need to keep my neck warm. I'll model it for you in a few days...It's almost done. So, What's on my needles? I'm heading out on a vacation. I won't be anywhere near a sewing machine and our cruise has a few sea days. It took me days to find and choose just the right project to work on, just in case I have a little downtime. 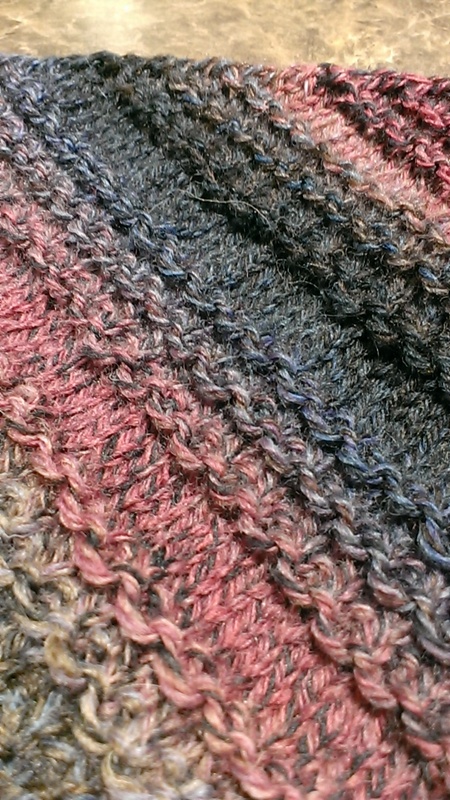 It's pretty simple, yet has a lovely detail stitch. It's lightweight yarn, so easy to bundle up.. It's a cowl called That Nice Stitch, and is available here on Ravelry. It will be a narrow scarf with two loops around your neck. It has the nicest look to it. I'm knitting it out of sock yarn because I don't like anything to heavy around my neck. 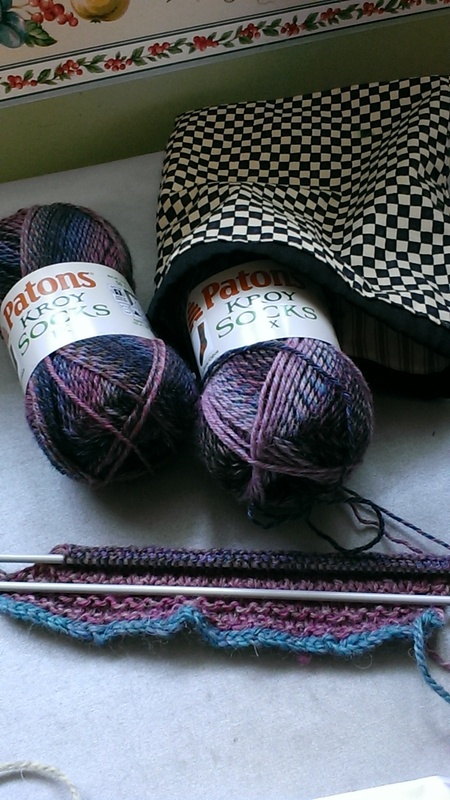 I thought I'd better start the pattern in case I have a problem. I'm glad, because I didn't remember how to do a provisional cast on, so a 2 minute video on youtube refreshed my memory. Easy peasy. 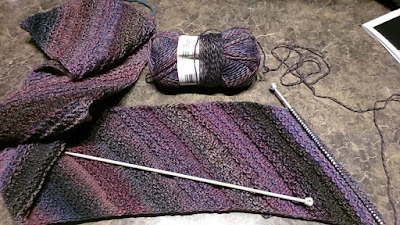 I have my cast on done, and two inches of the pattern knit now. So it's easy to pick up and continue if I get the urge to knit.. It will be 48" when I'm done. It's now all tucked in my little drawstring pouch. 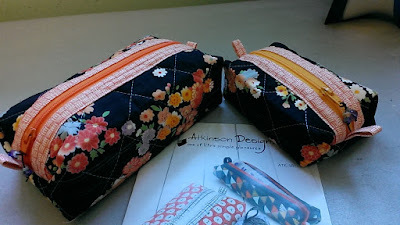 I made a few of these little pouches last December and shared the free pattern here. I'll report back in a few weeks when I'm back at the computer, as to how much down time I had to knit. I'll not be blogging in the meantime, unless I run into a quilt show or something while away!! Zip it up Pattern by Annie's. In the box of kits that Pat sent, many of the patterns are by Annie's. 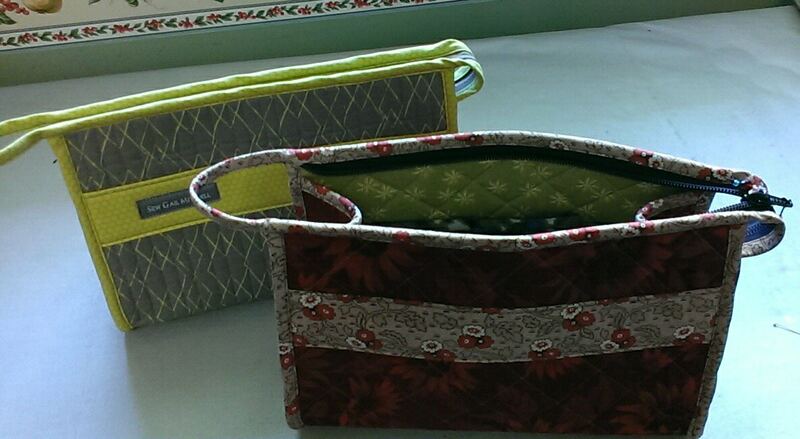 So this is the third or 4th project that I've made from Annie patterns in the past few weeks. I am getting to understand how she writes her patterns. The patterns have similar layouts etc. 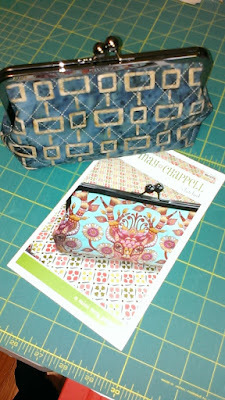 I had worked on this Zip it up bag by Annie's earlier in the week. This pattern makes a nice size brief for your patterns and notes etc. It's a complicated pattern, but if you know me, you know I love a challenge. 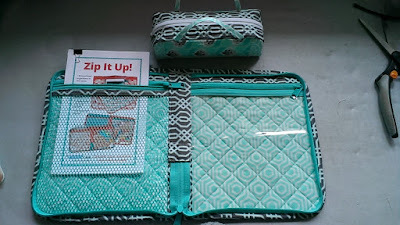 This project has four different zipper techniques in it. 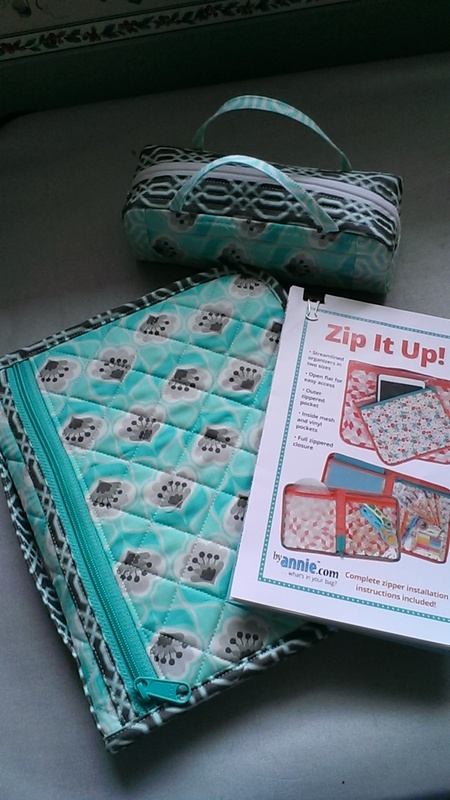 I loved discovering how to use the new Annie's Zipper by the yard. In this kit, there was a meter and a half of zipper and four zipper pulls. 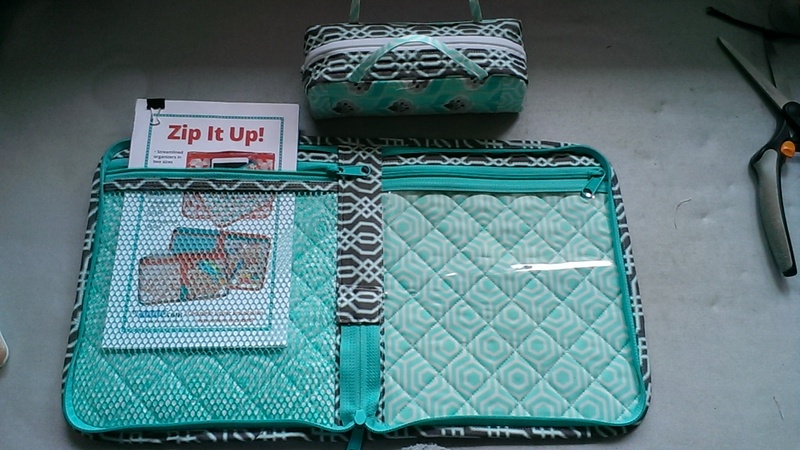 One zip pocket on the outside cover, two in the inside, and one zip that closes the brief. 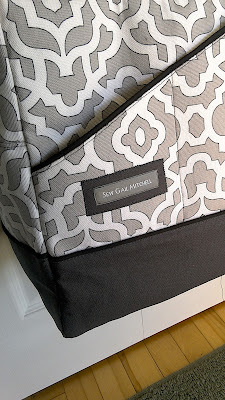 I like the finished project but it took immense concentration to get each of the zippers installed correctly. I was stumped by the zip that closes the brief. After looking at it for a few days, I figured it out... It turns out I had installed the zipper tab backwards. See the cute little bag in the back. 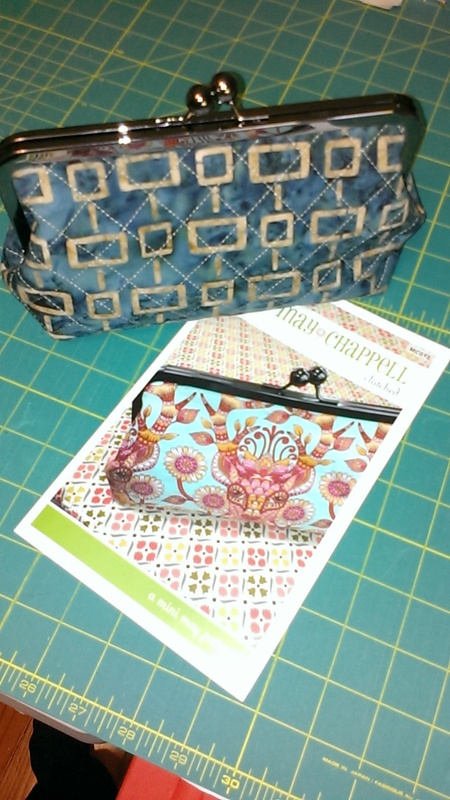 I dug into Pat's box of kits, and I just loved this little frame bag pattern by May Chappell. The frame is 8 inches wide. I finished this sweet bag in a frame project a just a couple of hours. 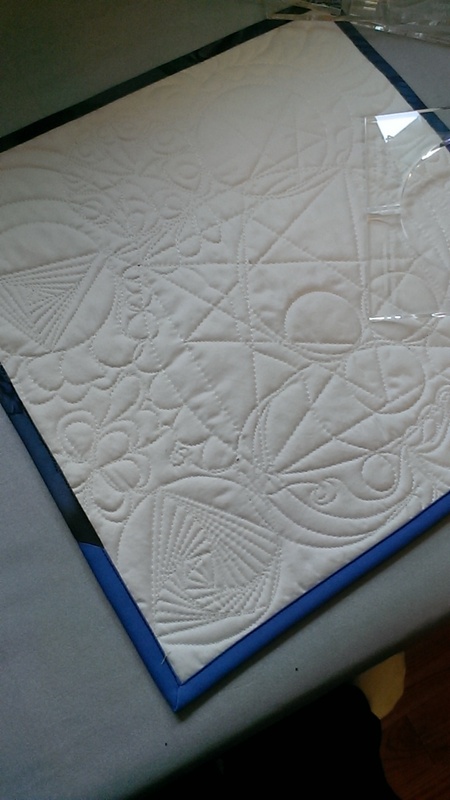 It's easy to put some cross hatch quilting on the outer cover for interest. 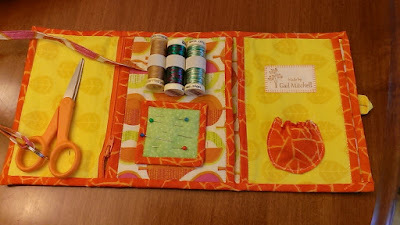 I put some of my quilty supplies in it to show how big it is. Cute, eh! I was working on this sweet Pack it In bag when I came to the instruction that said, round off the corners with a 3.5" circle template. Hmm, I don't have one, that I can remember. I could not locate my geometry set, or I would have drawn one. I searched through my cupboards to find just the right size can to round off the corners. 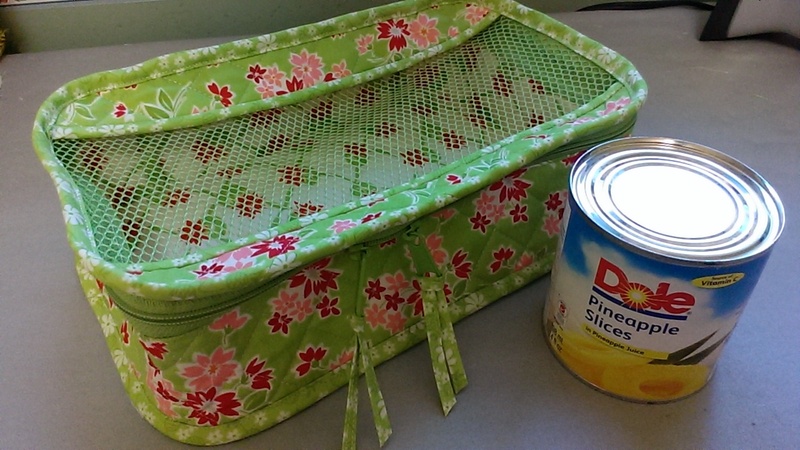 A can of Pineapple. A good quilters tool! 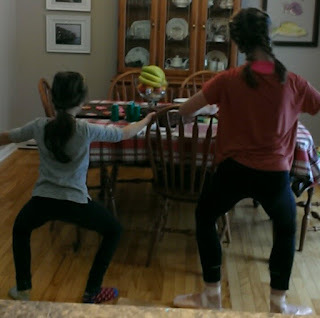 My sister was visiting from Nova Scotia over the Thanksgiving weekend. 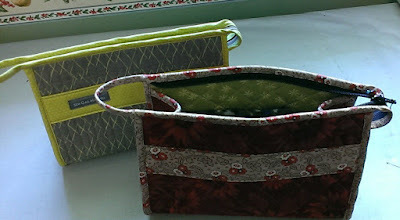 I had just finished making my first open wide bag and felt the need to make one or two more. 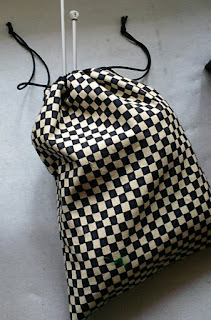 So, we poured through my stash, and we each picked fabrics for bags for ourselves.. 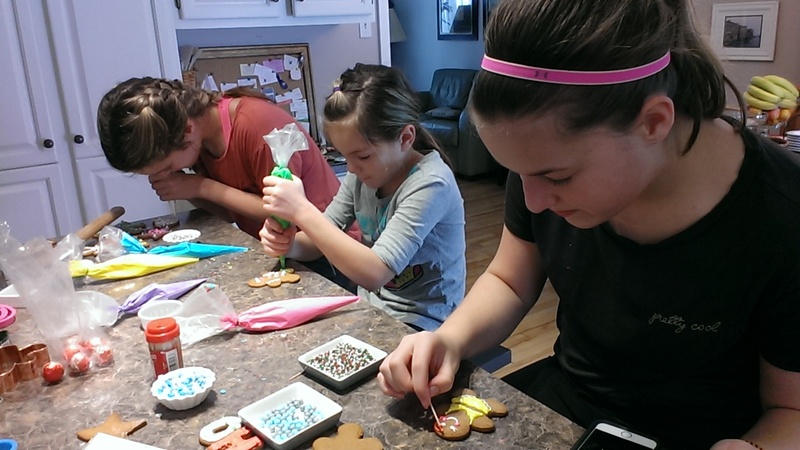 I worked on them while house-sitting in Moncton this past weekend. They're now finished. Mine is the grey green combo, and my sisters is the burgundy floral combo. These are pretty simple to make once the pre-quilting is done. Do you know what...I still feel the need to make more. Maybe my girls will each be getting one for Christmas! And now that I think of it, I do have a baby shower to go to. This would make a great carry-all for baby things. Do you have any other suggestions? It's another beautiful day. The sun is bright and our new grass is so green. 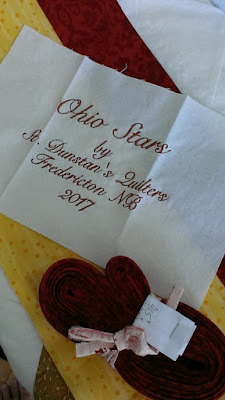 The Ohio Stars quilt is St. Dunstan's Raffle quilt, 2017. 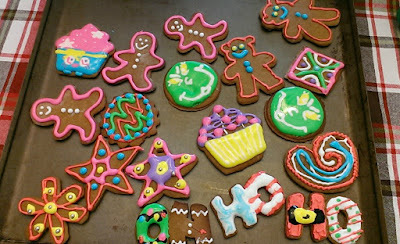 I delivered it to the girls this afternoon and had a cup of tea and cookie with them. They really liked the harvest color especially since it is fall. 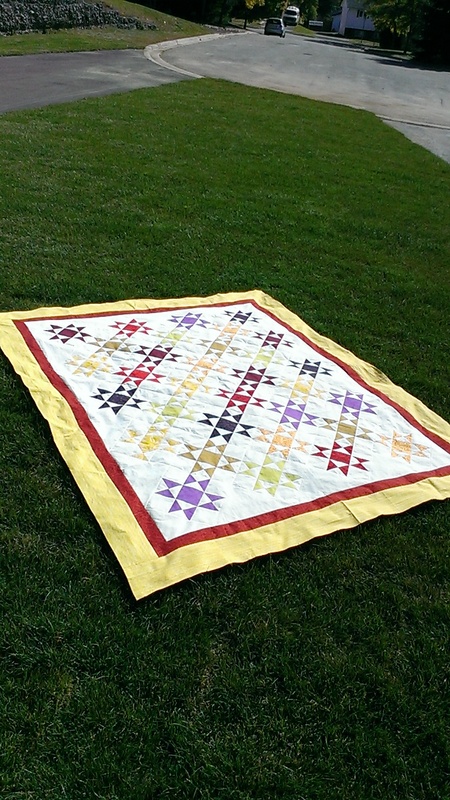 They will hand quilt it over the winter. Tickets will sell late next spring and summer. 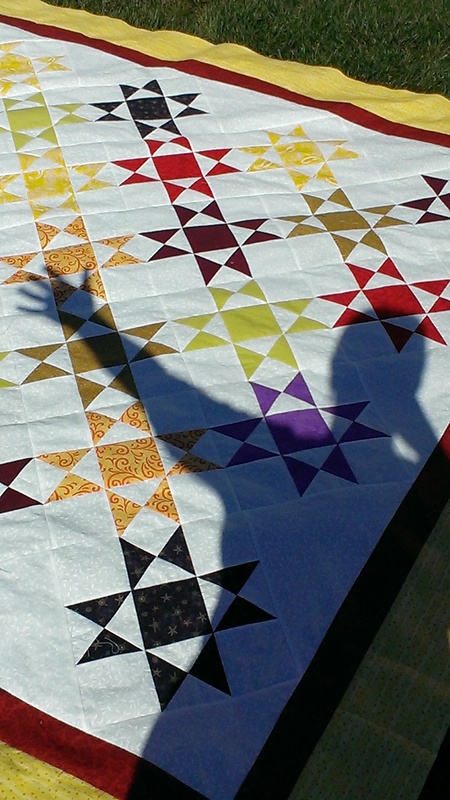 I believe the quilt will be raffled in October of 2017. This is what happens when the sun is at your back!! look at the beautiful new green grass. I was at the Sussex Quilt Show a couple of weeks ago. 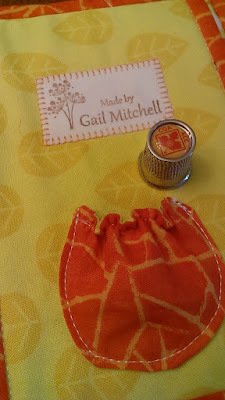 I saw the unique Wide Open bag that Gail F. made. I had seen it on her blog here, but when I saw it in person, I knew I had to make it. 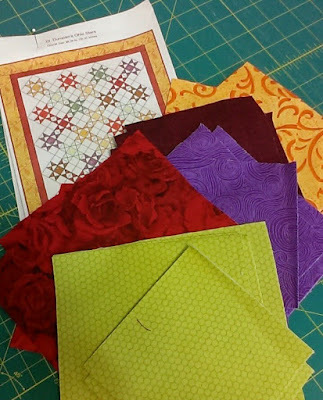 Well it happens that I just got a package from Pat at Heartfelt Quilt Shop in Florida. And what was in the package...among many things, was a kit to make the Open Wide bag. It's like serendipity. I love when that happens. 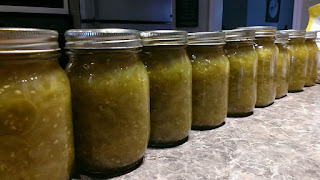 I really have to thank Linda at Stitch Lines for her gift of green tomatoes. The other day she had posted on her blog about her bumper crop of tomatoes. I wasn't long volunteering to go over to get the rest of the tomatoes. I showed up early the next morning and Linda and I picked two big shopping bags full and cleaned out her tomato patch.. 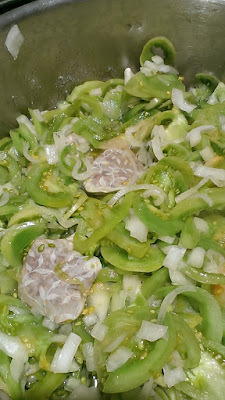 Chopped and ready to simmer. pouches for the pickling spice. I haven't made chow chow in a long time, but a quick request to my sister-in-law Shirley, got me her mother's recipe. It's a family favorite. 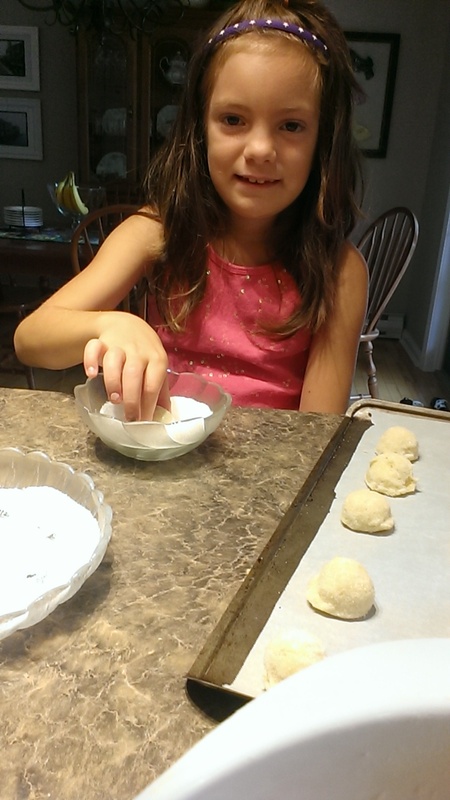 The recipe is just precious. It said, " chop tomatoes and onions until the big blue pot is half full". The next thing was to add vinegar until you see the vinegar when you tip the pot! Well, we got the recipe all figured out and my hubby and I hand chopped the 11 pounds of tomatoes last evening. We had fun talking about the old days and recipes and all the stuff his mother used to cook. The recipe said to put a couple of handfuls of salt to the chopped tomatoes, then put a plate on top and let sit over night. This morning, it was very easy to drain, rinse, then simmer for a couple of hours, then bottle. The chow chow is made. The house smells delightful. We tested the chow with some crackers this afternoon. It's delicious. And I have a nice bottle set aside to deliver to Linda. She will be able to enjoy it at her Thanksgiving table. I know she's got lots of company coming. 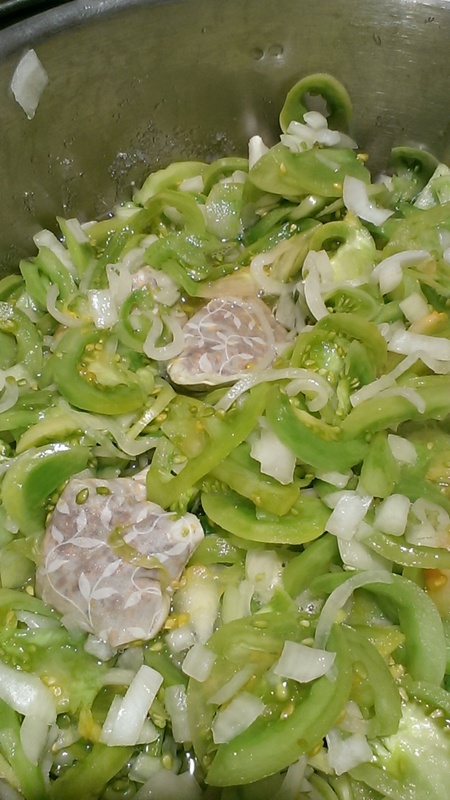 Next Week, when the rest of the tomatoes ripen, I'll be making a small batch of salsa. Can't wait.. Many thanks Linda!! 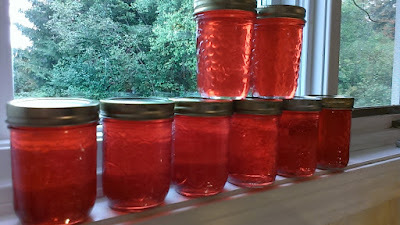 Well, my friend Lee was telling us at coffee this morning about making crabapple jelly. It was a nice story about a crab apple tree that she admired in her neighbourhood for some time. She happened to cross paths with the owner of the tree. After having a nice conversation about the tree, she offered Lee some of the crabapples. Lee prepared the jelly and said how beautifully clear and pink the jelly was. It sounded so nice. That's all I needed to hear.. I've never made it before, but I have been watching a crab apple tree in my secret garden. The apples are so red this year, they are visible from quite far away. I couldn't wait to come home and see if I had enough of the little beautiful red apples. Sure enough, I did. More than enough. After a quick trip to the store to buy cheesecloth, my husband helped me prepare the juice. A few hours later, and using this Certo recipe, we have 8 beautiful jars of Crabapple Jelly. 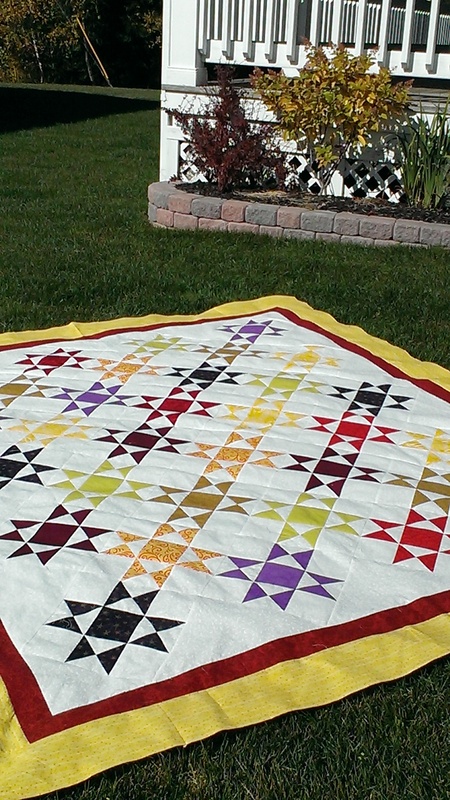 The Ohio blocks are a dream to sew. 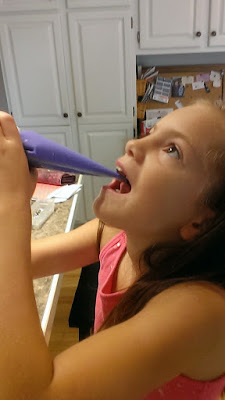 I just loved making the hour glass blocks. 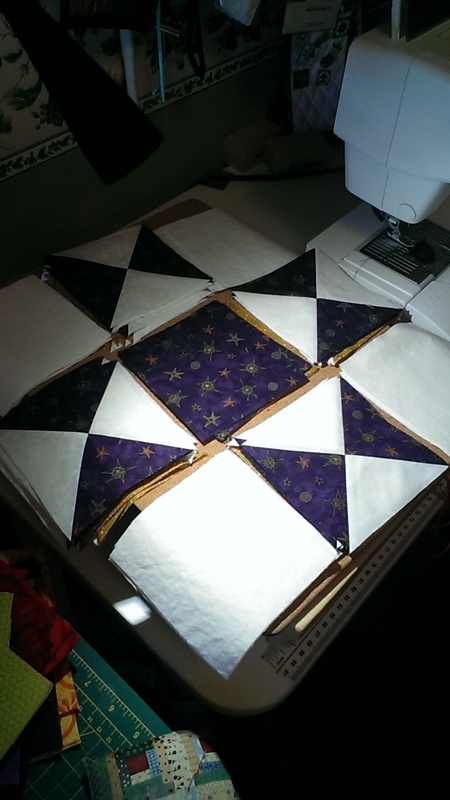 I got most of the blocks sewn last Tuesday at the Ville. I finished the last 4 blocks this morning, and gave them a press. Let's see what they look like. I've laid out the on-point arrangement. The eight colors are a depiction of the fall harvest. Purples, orange, greens, yellows and reds. I've tried to mix up the colors pretty good. I've taken this photo, and will look at it again tomorrow to look for anything that bugs me. I find it helps to look at the arrangement through a camera. Already, I can see a couple of things I will change tomorrow. Stay tuned next week for another update. 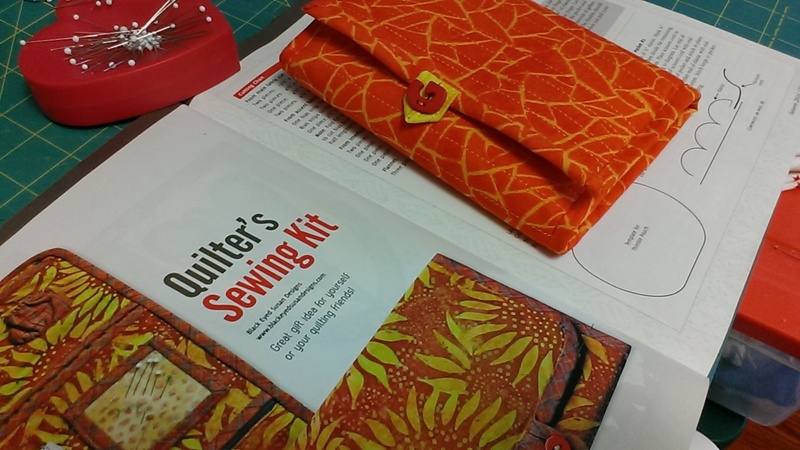 In the Fall CQA Newsletter, there is a pattern for a Sewing Kit. It's just darling and so useful. 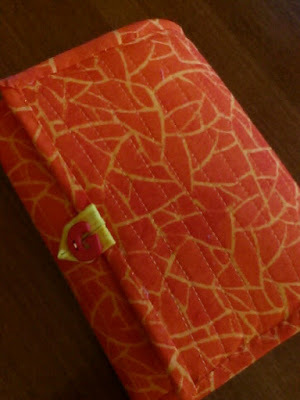 I had scraps of fabric in my scrap bag, so I made up a prototype. It's nice. I love some of the nice thoughtful details. 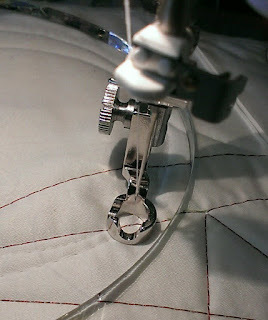 In particular, the scissor cord end is neatly sewn under the spools of thread. And when you close the kit up, the spools of thread, and the thimble are off-set with one another to reduce bulk. 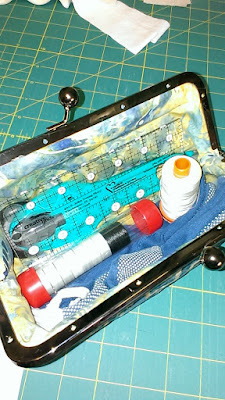 The scissors, if small enough can be put in the zipper compartment, or you can store binder clips in it. Smart thinking... Thanks CQA. 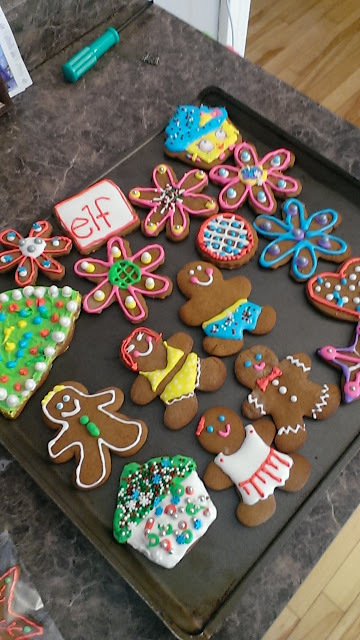 I'll definitely be making another one or two! I made a small project this week. It was very simple. A holder for my favorite rotary cutter. It was quick because I had some already quilted fabric sandwiches laying around. 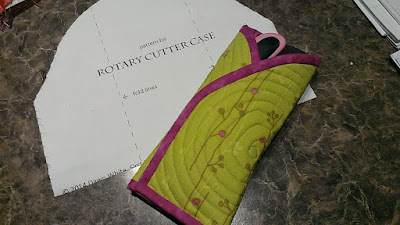 Why not make a coat for your cutter.. Click here for the free pattern and tutorial. While I'm at home and overseeing our landscaping, I dug out a bag of supplies that I brought home from Florida last spring. 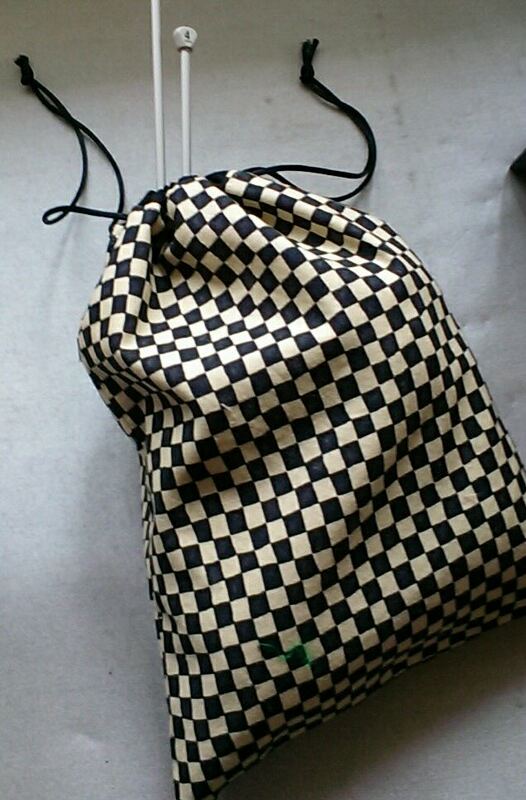 It's to make a small duffel bag. I really was attracted to the colors and the size of the bag. I put it on my to-do list. I've been thinking of digging it out for months now. 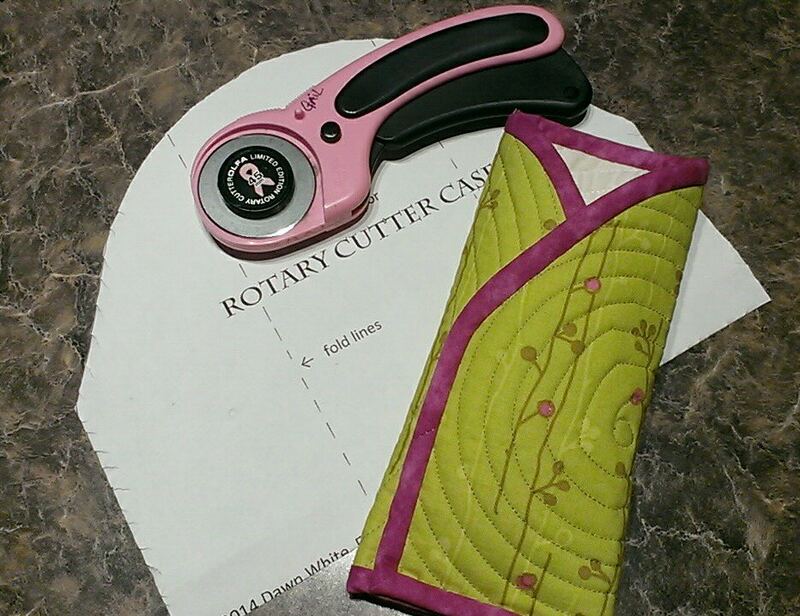 The directions call for all kinds of stuff that a quilter would not normally have. I've read through the pattern a few times, but until you actually get started, the directions had very little meaning. Actually, it all looked a bit scary..
Well, this was the week. Knowing the landscapers were coming and I would be stuck at home for a few days, I cut out all the parts on Monday. It seemed like there was 30 pieces of all sizes. Well, there wasn't that many, but with the different fabrics, piping, interfacing, foam, strapping etc, my brain was mush after cutting everything out. It was good not to even look at it on Tuesday.. I started it yesterday morning. I followed the tutorial, step by step. After re-reading some steps several times, I got the hang of it... The two side pieces done. I found that I had cut two pieces incorrectly. It was throwing me off. I was tired from thinking so much... the sewing part was easy. I was done for the day. Way too much thinking.. It would have been easy to put it all back in the bag and finish it later... haha.. This morning, I looked at it... and loved what I had accomplished yesterday. It was motivation enough to continue. I worked on the zipper panel and the bottom part. The zipper was a little tricky. 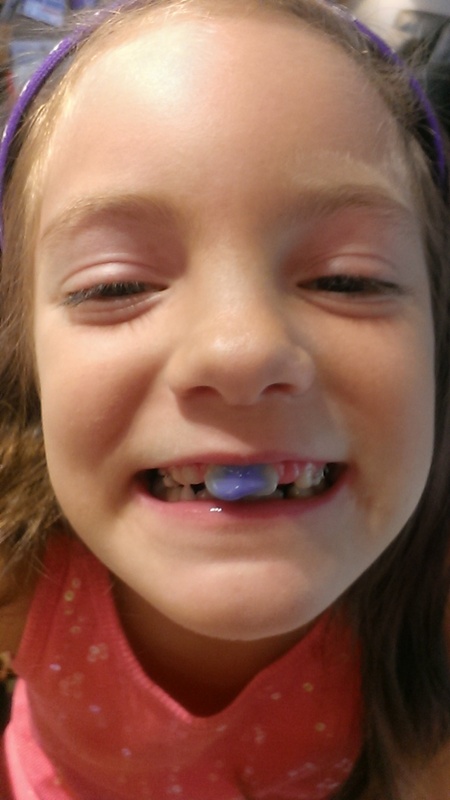 It was a big zipper... with big zipper teeth. I just couldn't just sew through that like I usually do with zippers. I got it done.. With all the components ready, it all got carefully pinned, and clipped together. The sewing was simple. Although, it was really weird to use a 1/2 inch seam allowance. Yippee, it's done. I'm so pleased with it. The big question is, "will I make another?" Maybe. Are you feeling brave? Want to make one for yourself? 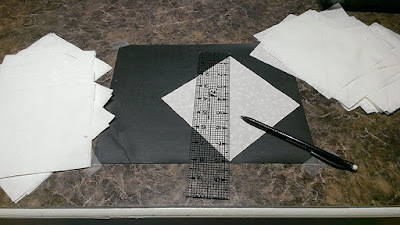 The free pattern and picture tutorial is here at Sew4Home..
Before going to my Sew Tuesday group this week, I decided to draw my diagonal line on my 48 white blocks. These will be for my 96 hour glass blocks for the Ohio Stars. I came across this post. (Wait. I can't find the YouTube, but I will continue to look for it). The suggestion offers a slightly more efficient way of handling the drawing of the diagonal lines. Take a piece of fine sandpaper, tape it to your desk. Use this as your work surface to draw the diagonal line. It stays in position nicely and helps the pencil marks adhere... I did like the technique. The good news is, Tuesday has come and gone, and all the hour glass blocks are done. This week, when I have 10 minutes at a time, I will trim these up to 4.5". 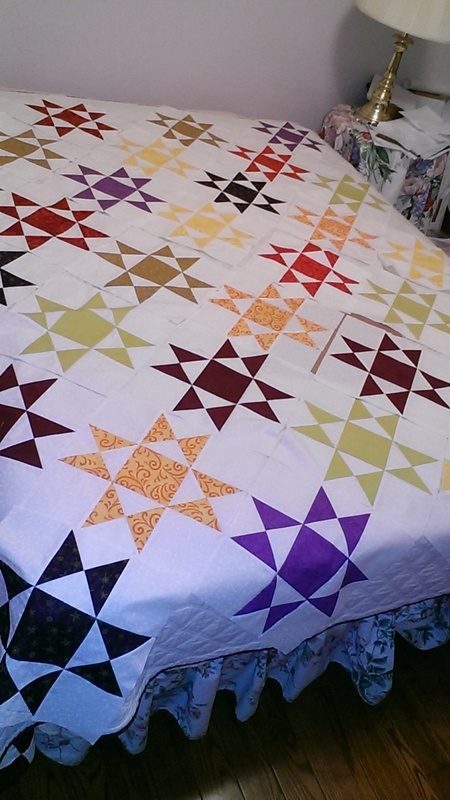 Next Tuesday, I should be able to sew up the 28 blocks. I'm so looking forward to Tuesdays this fall. We've started a group of Tuesday Sewers at the Ville. It's a very nice way to get work done on your projects and have a some social time too. Last Tuesday, I worked on a few different things. One of the things that I'm most happy that I got done, was 32 hourglass patches. See these are the first ones that will go into the St. Dunstan's raffle quilt. They are sitting next to my sewing machine and sometime that I have half an hour this weekend, they will get sewn up. 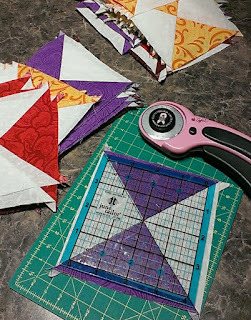 And again, this week, I'm preparing for the Tuesday sewing by pre-cutting pieces for the rest of St. Dunstan's Ohio Stars quilt. I have blocks cut to make 24 blocks. Wouldn't that be awesome if I got all the hour glasses done. So that's a total of 96 hourglasses. Well, might be a stretch to get done, but we'll see. Time is slipping by, and I really want to give this to the St. Dunstan Quilters by the end of October. With my new found Tuesday time, it will be no problem at all. One thing that I realized last week, which was the first Tuesday of sewing, is that I should only bring a couple of projects to work on. To have a little break from the hourglass blocks this Tuesday, I will bring another small project to work on. I'll show you next Tuesday. Sew, what are you doing on Tuesday's this fall?. Want to join us?... There are a couple of spaces left. Contact me and I'll give you details. I bought a new free-motion foot for my Juki sewing machine. I use my Juki all the time for free motion stitching, when I'm home. My Juki is a domestic straight stitch machine. This new foot will let me use straight and curved rulers as a guide when free motion stitching. I borrowed my friend Lee's new rulers for a little practice. I think I'm going to really like this for a bit of a change. I enjoyed the circle template more than I thought I would...actually, I loved it. 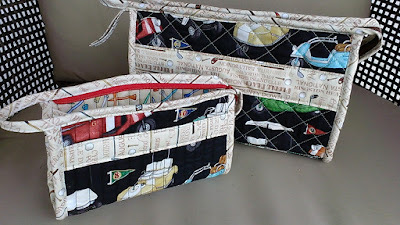 I have some straight and curved rulers on order with Diane at Country Crafts. I'm making a few table runners to practice on when the rulers come in. Notice the long straight lines that form a star in my sample. I've used the ruler as a guide and stitched free motion. And look at the perfect circles. All this was done with the feed dogs down. 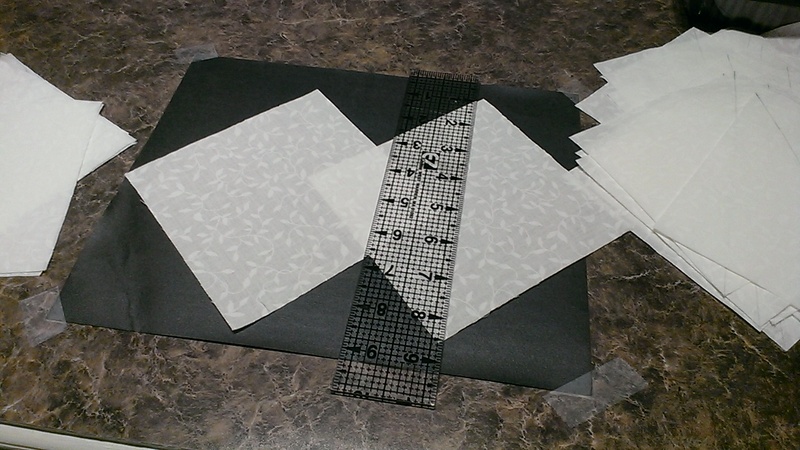 In between using rulers, I just free motioned like normal to fill in the spaces. No changing feet. I've bound my practice sample.. I'm sure some cat somewhere would love to lay on this. It all started out as a pretty typical sugar cookie making day. Aurora's job was to roll the cookie dough in sugar and put them on the tray. 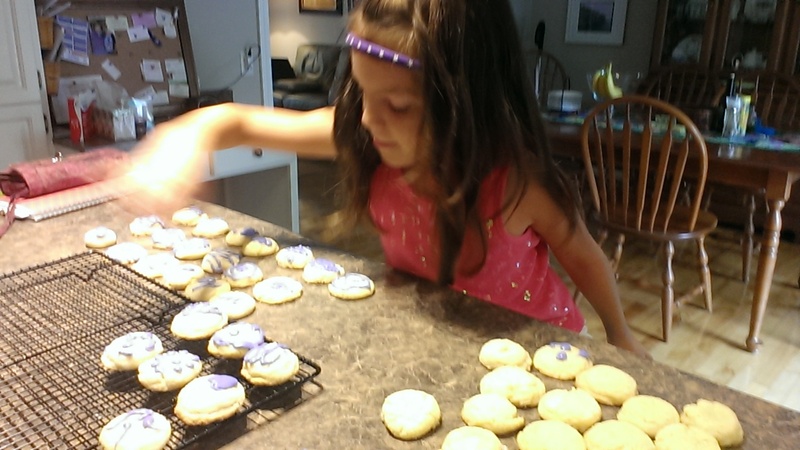 I would bake them, and she would ice them when they were cool. So, it's all normal up until now. when I was going to throw out the left over purple icing. Then it got a little silly. 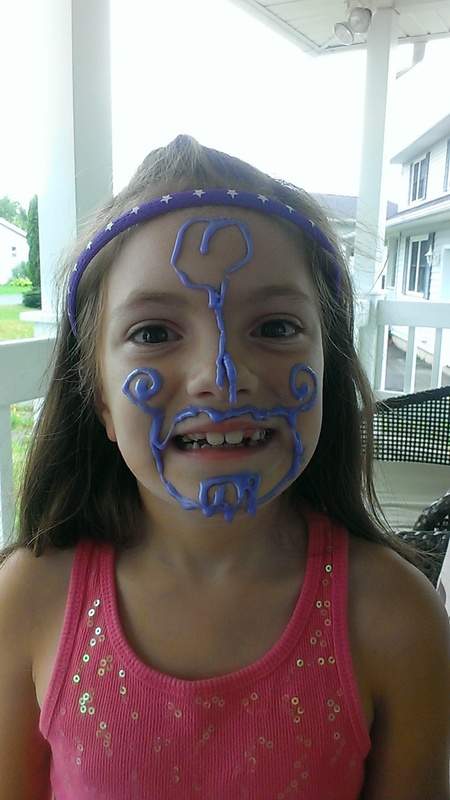 I painted her new front teeth with the icing. She thought that was cool. And then came a mustache. 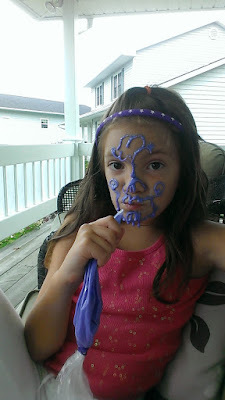 It kind of looks like henna for her face now.. 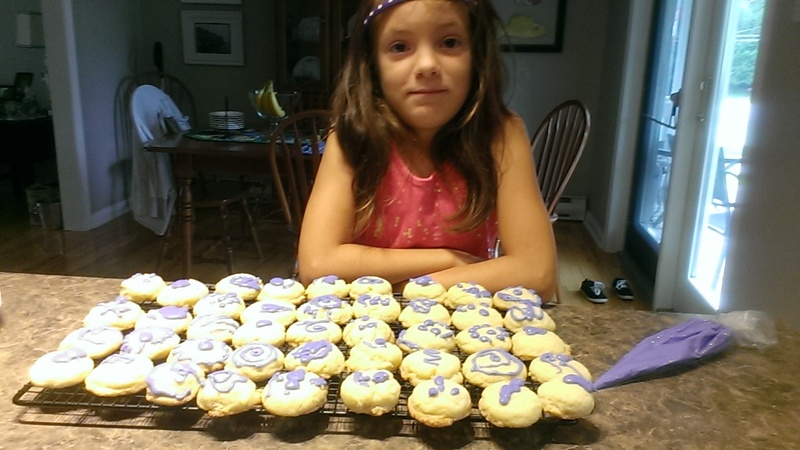 The icing is starting to harden. I tell her not to smile..
with a mustache, goatee, and a beautiful heart on her forehead. She thought all this was so fun. and happily threw the rest out..